After attending college in California and living there for seven years afterward, Bonnie Markowitz returned to her hometown of Framingham, where she now lives with her daughter, Michaela, who turns 4 this month. 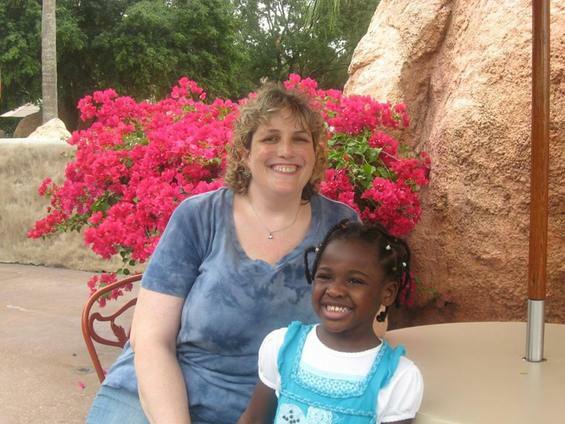 Bonnie, a single parent, adopted Michaela, an African American child, in an open domestic adoption; the birth mother chose Bonnie to be Michaela’s mother while she was still pregnant with the baby. In this interview, Bonnie discusses the importance of family heritage to both her and her daughter, and explains that, in her experience, race and religion haven’t been the divisive issues that they might have been in the past. Thanks to interfaith families and adoption, the Jewish community doesn’t really look like it used to, and in many ways the concept of “looking Jewish” has disappeared. But as diverse as the community is, do people express surprise when they learn that a little girl named Michaela Markowitz is African American, considering that most of the African American community isn’t Jewish? I think most people assume that Michaela, for example, celebrates Christmas, but when I mention we celebrate Hanukkah, they usually accept that. My dad often jokes that she will be the first African American Jewish woman president, and I think she can do this or whatever she sets her mind to. I agree that the typical Jewish family landscape has changed, but I find, especially in our community and her day care, it has never really been an issue. We are looked upon as a normal single-parent family. I have noticed that the older generation has accepted us with open arms also. I wondered what my neighbors in my condo would think or maybe my parents’ friends, since my parents watch Michaela one day a week, but everyone has been accepting of Michaela. I think that people are realizing that there are so many children out there that need a family that you should be concentrating on that instead of the color of their skin or their ethnic or religious background. How has parenthood made you think more about your own Jewish identity and what you hope to share with your child? When we lit the menorah this year in the house, it gave me such pleasure to watch Michaela say the prayers with me and want to participate. I have lots of fond memories of celebrating the various Jewish holidays. I am enjoying teaching them to Michaela and celebrating with our family and friends. In fact, the first thing I did [after Michaela’s birth] was plan a baby-naming ceremony at Temple Beth Am, where I grew up going and my parents are still members. It was important to me to have this celebration, since Michaela is named after my grandmother, Marian, who passed right before she was born, and her middle name, Rebecca, is after my other grandmother, Ruth. The Jewish experience and the African American experience have many elements in common — joy, suffering, perseverance, activism. Certainly Michaela is an individual, not just a representative of a group. But her combined heritage is an unusual one, when taken together. How do you plan to teach Michaela about her families’ backgrounds, and what values do you hope that she gets from both? There are a lot of great African American public figures that I have started to tell her about, and I will continue to educate her in the future. And even though she is young, she also knows she is Jewish, too. I hope that Michaela learns the most important lesson is that it doesn’t matter what color your skin is but what is on the inside. I want her to follow her dreams wherever they take her, and I will be as supportive as I can. To the best of your knowledge, was religion an issue at all for the birth mother who chose you to be Michaela’s mother? Religion never really came up. I did have a photo of my brother and me celebrating Hanukkah in my adoption profile book. The agency I worked with suggested that I delete that photo out, saying it was not a good idea to have a religious holiday picture in, but I went with my gut and left it in. If being Jewish was an issue for the birth mom, she never mentioned it. She just said she knew I was the one, and that she was having this child for me, so that I could realize my dream of becoming a mother.